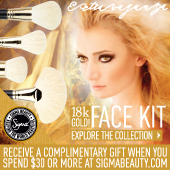 Today we are launching the beautiful and highly anticipated Sigma Beauty Extravaganza Face Kit! This kit features four unique brushes specially designed to deliver a luxurious makeup application. This is a lavish collection with one of a kind brushes and 18K gold plated ferrules! The brushes featured in the Extravaganza Face Kit are the F90 (Fan Brush), F92 (Blush Brush), F94 (Kabuki) and F95 (Powder Brush). The brushes come in a deluxe carrying case, perfect for traveling and storage. We have created new affiliate banners to celebrate the launch of this gorgeous kit. To update your blog with one of these banners, simply save the image to your computer, upload the banner to your blog as a picture, and insert your affiliate link as the URL! 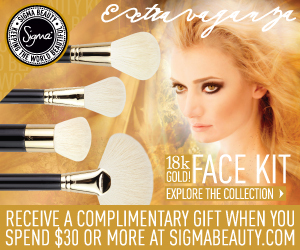 The Extravaganza Face Kit is Sigma Beauty’s most unique, exclusive and luxurious brush kit. As an affiliate, these are great selling points! Share the new product information with clients and watch your sales grow! For more information about the Extravaganza Face Kit, click here! Dont you have the bigger banner horizontal anymore? Will this be a permanent collection? You will sell brushes loose or just the kit? @Roana We do not have the horizontal banners for this set of banners, but there are a variety available on our blog! @Bee Yes, this is a permanent collection! @Debora (Arca do Esmalte) No, the brushes will not be sold individually, they will just be available in the kit! Where is the horizontal banner? Lindo esse Kit! Já está disponível em nosso site! Eu precisava de um banner horizontal! Are these banners available in Portuguese? Who should I email to get them? This is beautifull. The ultimate gift for this season. @Gabi Rebello We do not have the Extravaganza Face Kit available at this time, but you can email affiliate@sigmabeauty.com for other banners in Portuguese! Eu amei essa coleção, eu queroooo!!! Já postei lá no blog esse lançamento chegou para arrasar! I LOVE that this set contains a fan brush... Frankly, I wish all of the Sigma brush kits would.